been well - she had bad bronchitis at Christmas so with winter coming, and Toowoomba being a very cold place, I thought a little cuddly blanket might be a good idea. 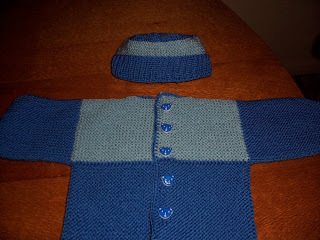 Here's the link - it's a free pattern! 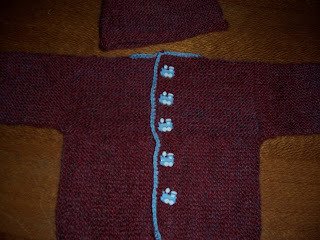 If this doesn't work, it is in Creative Knitting, February 2008 - a free pattern! Or email me! 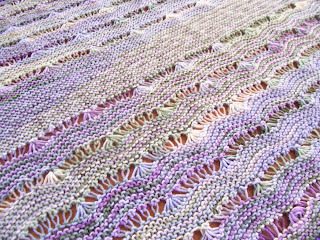 I made it in Red Heart Super Saver in Watercolour Multi and Lavender Solid - I changed the pattern by substituting 5 ridges of garter stitch between the bands of shell and wave stitch. I crocheted a simple scalloped edge all around, . using a double treble (triple treble for my American friends). Made another Baby Albert and beanie in Villawool Saturn 7 ply - that is the last of this very nice yarn - 37% wool with 27% mohair and 35% acrylic . Very soft and such a pretty colour and a joy to knit with on 3.75 mm needles. Last of my blue train buttons too! And another Baby Albert! Used up some left over anonymous yarn in blues and made a little hat to match this one too. Teddy Bear buttons from Dave in Florida. I have been busy unravelling half knitted donated items in order to re-use the yarn for other garments - I still have a big box full of these to unravel and wash. I started a Wavy Doubles crocheted baby blanket yesterday in yellow, pink, white and grey - all pale colours I might add - it should look good - but as the original sweater was knitted in short stripes, I have a lot of ends to work in as I crochet! So I shall be posting pics of this in the next few days. 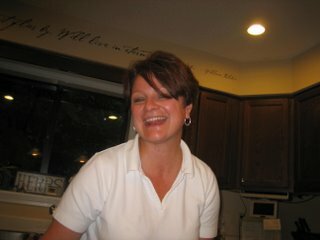 My 63rd on Friday 28th - how did I get to be this old?? Yvette, I love that blanket, it's beautiful! I'm sure Veronica will love it too. 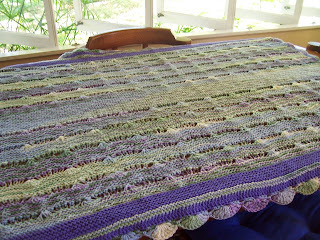 I love your blanket Yvette, very pretty..i tried the link and i didn't see the pattern? The baby Albert's are great and the blanket is gorgeous! I love the combination of colors! The afghan is beautiful! You did a great job, and I love the way the colors move through the piece. 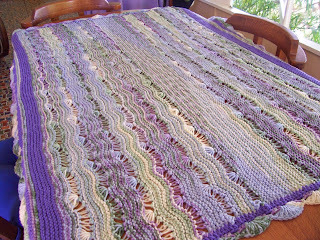 Your knitting is all beautiful and I have seen the blanket it is also very soft and the colours are superb. Well done Mum! Dave's Absolutely Gorgeous, Beautiful Buttons! !